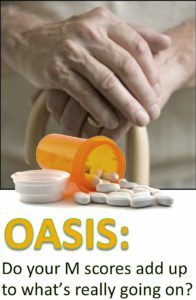 Do your OASIS scores add up to what’s really going on? 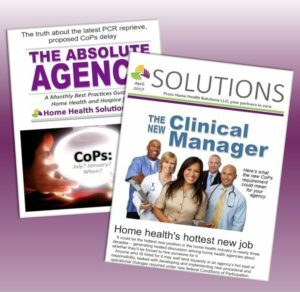 Editor’s note: This article originally appeared in the July 25 issue of The Monday Fix, a free weekly email from Home Health Solutions featuring home health coding and OASIS tips. Click here to subscribe. In the complex world of home health, where boundaries and guideposts are almost constantly revised and re-interpreted, an agency’s success may well revolve around one crucial skill: the ability to accurately use the data collection tool known as OASIS. The Outcome and Assessment Information Set (OASIS) is emerging as a critical performance measure for the field in general and for individual agencies. “It’s hard to overestimate the importance of this data set,” says J’non Griffin, owner of Home Health Solutions LLC. The OASIS affects patient outcomes, reimbursement, STAR ratings, Value Based Purchasing and an agency’s bottom line. And that’s just in its existing form. Come Jan. 1, OASIS will ratchet things up a notch. 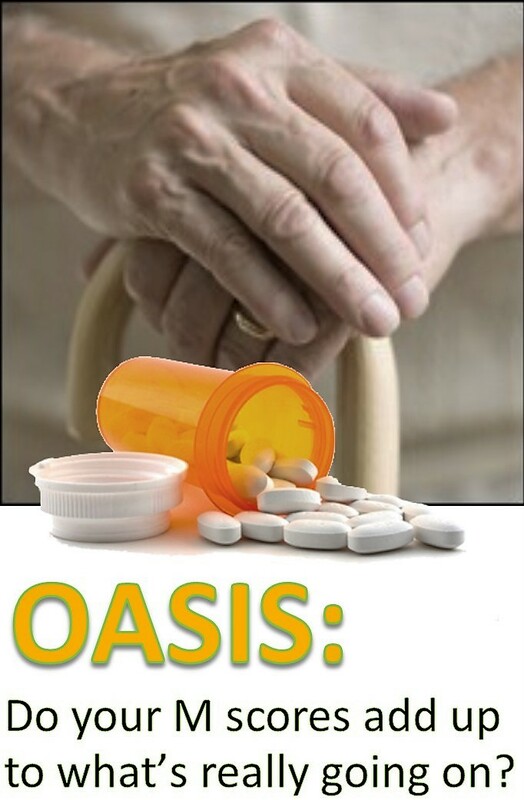 The Centers for Medicare and Medicaid Services (CMS) implements a revised version of OASIS on the first day of 2017, and the new version known as OASIS C-2 will feature the first quality measures from the Impact Act of 2014. This Act established some standardized measures for easier reporting and sharing of data between skilled nursing facilities, long-term care hospitals, inpatient rehabilitation facilities and home health. The goal is to facilitate coordinated care and improve patient outcomes, providing better post-acute care for Medicare beneficiaries. Among other data, C-2 items will capture standardized reports of skin integrity, a patient’s functional status and cognitive function, medication reconciliation, incidence of major falls, transfer of health information and care preferences during a patient’s transition from one facility to another. This is important information for the home health field, J’non says. “The overall goal is to collect data necessary to create a vital picture of what’s actually going on in home health care,” she says. Agencies are tasked with the same goal on an individual level as they complete the OASIS for each patient. But that goal can easily be hindered by hurrying through the process, looking at it as simply additional forms to be filled out, or – perhaps most damaging — limiting its scope by failing to understand the nature and reach of the information it seeks to collect. 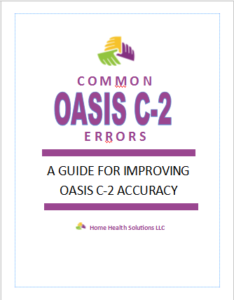 Accuracy in reporting is requisite for proper use of OASIS to collect necessary information, yet many clinicians struggle to correctly capture the information. It’s quicker and easier to create a superficial account, relying on a cursory overview or a patient’s information alone. But that can be misleading, and J’non believes agencies must train their clinicians to look at how all the information about a patient works together to create a cohesive report. In some cases, clinicians must look beyond the narrow focus of the question at hand to consider other circumstances which may affect the answer, and carefully weigh what a patient tells them against the realities of a diagnosis by the physician, risk assessments, environmental evidence and more. Sheena Meeker, a quality review mentor on the HHS team, offers the following example of how it may be necessary to carefully consider all aspects of a patient’s circumstances to make sure OASIS scores add up to a true reflection of what is going on. Your patient is a 92-year-old male who lives alone in a single-story family home. His daughter assists with some errands, and occasionally meals at home. When you assess your patient’s ambulation status, you note the patient is a high fall risk, and uses walls and furniture to navigate through his home. He has a 2-handed walker in the home which he states he uses more than half the time for ambulation. His medications are located on the kitchen counter, and he spends more than half his time in the living room. The patient states there is no problem with remembering to take his medications and he does not need any help. You are able to confirm this with his daughter. How would you score M1860? b. (1) -With the use of a one-handed device (e.g. cane, single crutch, hemi-walker), able to independently walk on even and uneven surfaces and negotiate stairs with or without railings. c. (2) -Requires use of a two-handed device (e.g., walker or crutches) to walk alone on a level surface and/or requires human supervision or assistance to negotiate stairs or steps or uneven surfaces. d. (3) – Able to walk only with the supervision or assistance of another person at all times. RATIONALE: Even though the patient uses a walker more than half the time, safe ambulation for this patient requires at least supervision due to a high fall risk score. Safety of the patient is the key consideration in this case, and the high fall risk score directly impacts the correct response here. How would you answer M2020? a. (3) Unable to take medication unless administered by another person. c. (0) Able to independently take the correct oral medication(s) and proper dosage(s) at the correct times. RATIONALE: Since the patient spends the majority of his time in the living room and his meds are in the kitchen – AND he requires assist or supervision for safety with ambulation – this would require someone to assist with medications for safety. The patient’s safety is again the key consideration, and impacts the correct answer. This example illustrates how easy it can be for inexperienced, untrained and/or rushed clinicians to inadvertently mark the wrong answers on M1860 and/or M2020. The best protection against these kinds of accuracy errors is ongoing training, according to J’non. 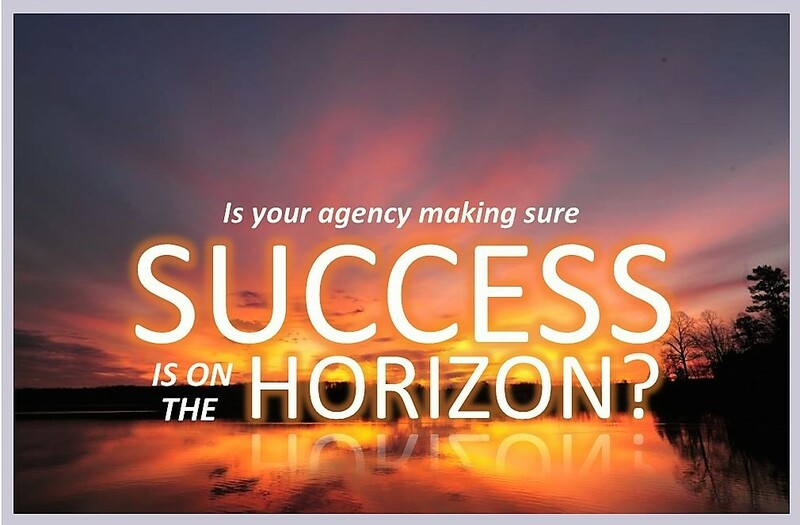 What is your agency doing to prepare? Smart home health agencies are gearing up for the implementation of C-2 by using the next few months to carefully review how well their clinicians are using OASIS, and provide the training needed to shore up weaknesses, J’non says. Who should agencies target for OASIS C-2 training? She is currently finishing up a brand new recording from HHS offering C-2 training, and will make it available via the HHS online store in the next few days. Being serious about providing excellent care means getting serious about providing ongoing training and support to clinicians. Click here to browse the HHS online store to see which online courses are available to help your agency.